Ben Morgan, picture by Peter Best Photography. They won 4-3 at Billingham Stars on Saturday before overpowering the same team 9-3 the following day. The league champions versus the 8th placed Billingham Stars was - on paper - the easy tie the top seeds deserved, but the team from Teesside made sure it wasn’t easy. In the tight confines of their home rink, the Stars finished their hits and made the Dogs work for every puck. Any concerns about a hangover from celebrating the winning the league disappeared sharply as Cam Brownley scored at 8:53 and added another in the 31st minute. Former Steeldogs net minder James Flavell kept Billingham in the game; the Stars were outshot 28 to 11 through the first two periods but came out for the final period only 2-0 down. Lloyd Gibson added a short hander before Baskatovs sparked a revival from the hosts which had them level at 3-3 going in to the last 5 minutes. Adrian Palak picked up his third point of the night with a goal that gave the Steeldogs a win and a lead ahead of the 2nd leg. On the bigger surface at iceSheffield, the champions looked much more at home. Goals from Gibson and Captain Lewis Bell settled any nerves and another from Brownley just before the first break all but confirmed the result. 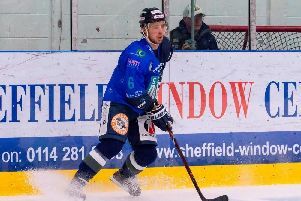 There were five more goals, including a first playoff goal for 17 year old Brady Doxey, as Sheffield dominated the second session and despite three goals from the visitors in the 3rd period, the Steeldogs ended up comfortable winners. Player/coach Ben Morgan and Milan Kolena both finished the game with four points. The semi-final will see Ben Morgan’s team take on the Solihull Barons who got the better of the Solway Sharks in their quarter-final. The first leg is on Saturday in Solihull with the second game at iceSheffield on Sunday (March 25th), faceoff at 5:30.